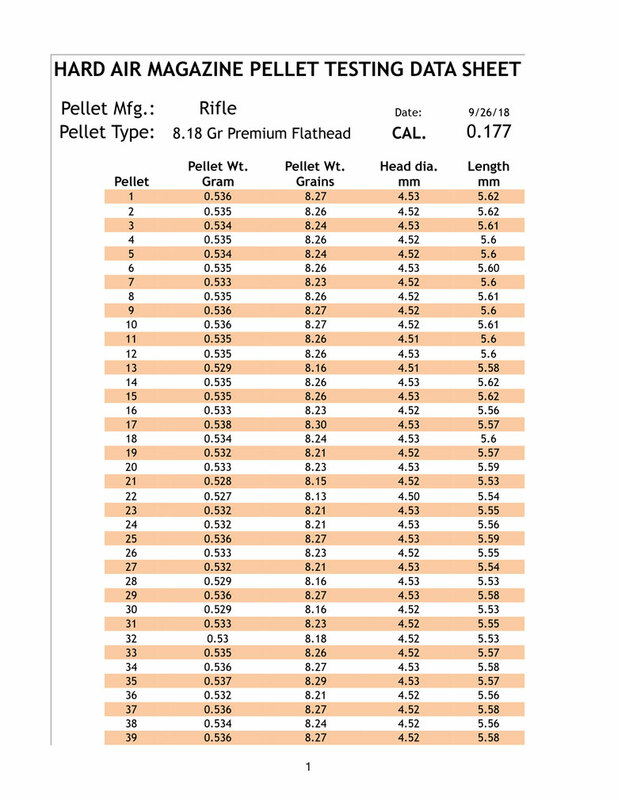 Rifle Premium Flathead 8.18 grain .177 caliber pellets are decent quality pellets showing better than average manufacturing consistency. 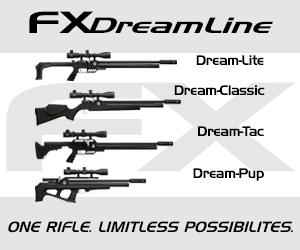 They would be very suitable for training and probably also club competition for 10 Meter air rifle shooters if your air rifle's barrel likes them. 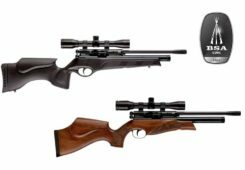 In addition, they could also be a good choice for general plinking at relatively short ranges with lower-power air rifles. The only real strikes against these wadcutters are for poor compliance with the manufacturer's specifications and being very dirty. These things may not concern the average shooter. At the current price, they are great value and an easy HAM Gold Award winner! 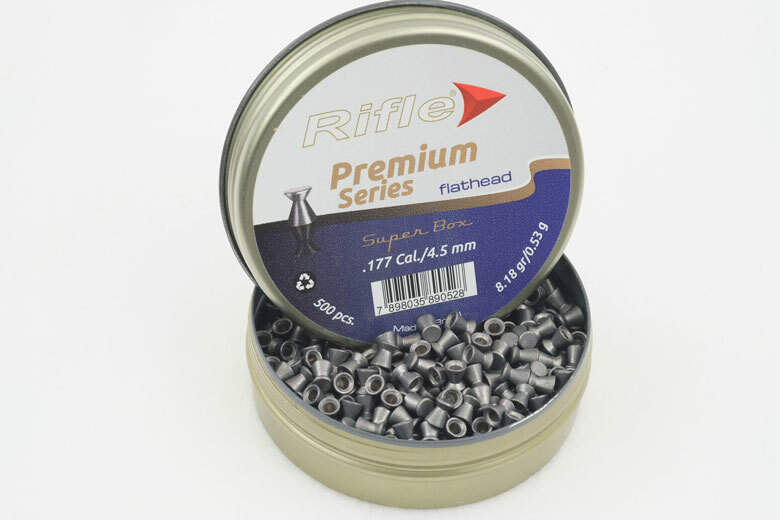 Rifle Premium Flathead 8.18 grain .177 caliber pellets are a recent addition to the US market from a Brazilian manufacturer called INDUBRAC – Indústria Brasileira de Chumbos, Ltda. The company is based in the outskirts of Sao Paulo in the south of the country. 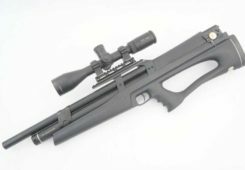 INDUBRAC manufactures a wide range of airgun pellets under the Rifle brand. “Premium Series” wadcutters are dedicated 10 Meter target pellets. In fact, the Rifle Premium Flathead 8.18 grain .177 caliber pellets are the “heavy” version. There are also lighter versions available in Brazil, although maybe not in the USA at the present time. Although largely unknown to US shooters, INDUBRAC claims competitive success for their Premium Flathead pellets in international competition. 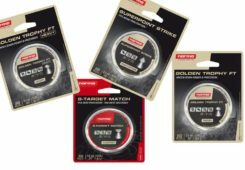 They are also very attractively priced in the US at 1.99 cents each – far below the mean price for .177 caliber lead pellets of 2.7 cents each. That makes Rifle Premium Flathead 8.18 grain .177 caliber pellets outstanding value for money for a good quality 10 Meter pellet. The manufacturer claims that the “heavy” Rifle Premium Flathead 8.18 grain .177 caliber pellets we are testing here have a head diameter of 4.50 mm. 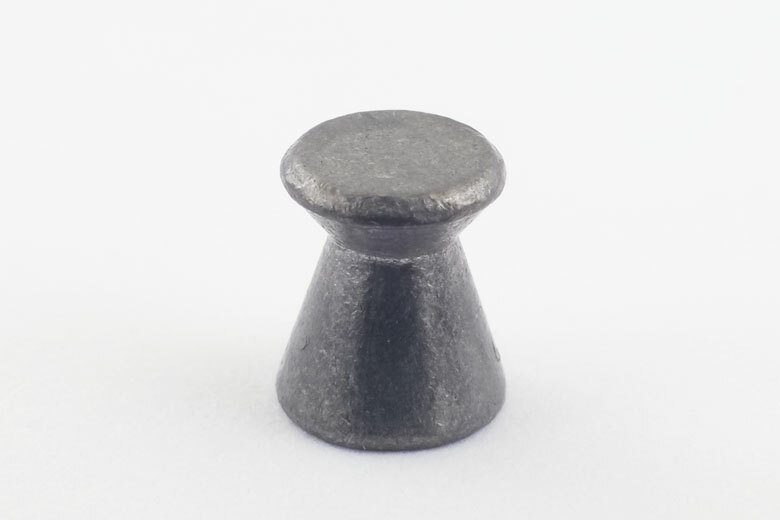 In the sample pellets tested by HAM, the average head diameter was 4.52 mm. 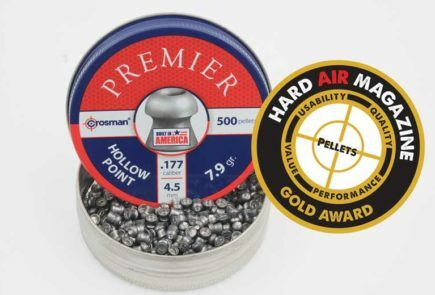 Only one pellet – that’s 2% of those tested – actually had a head diameter of 4.50mm. Likewise, the weight is claimed to be 8.18 Grains. However the average weight of the pellets tested by HAM was 8.24 Grains. Again, only one pellet matched the claimed weight of 8.18 Grains when weighed on HAM’s incredibly-precise milligram balance. 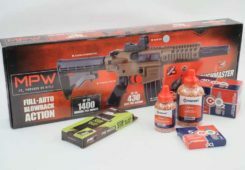 The over-spec weight of the Rifle Premium Flathead 8.18 grain .177 caliber pellets tested by HAM is the likely reason that the tin we tested contained 499 pellets instead of the 500 claimed – although the amount of lead dirt didn’t help either. (The tins are probably filled by weight not by actual pellet count). 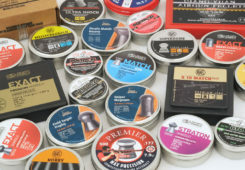 The manufacturer is to be commended for giving a Ballistic Coefficient for Rifle Premium Flathead 8.18 grain .177 caliber pellets. They say it’s 0.012. In HAM testing, we found a BC of 0.011. However, we were shooting the pellets much faster than would be expected for 10 M competition ammunition and the 0.012 value is almost certainly correct. 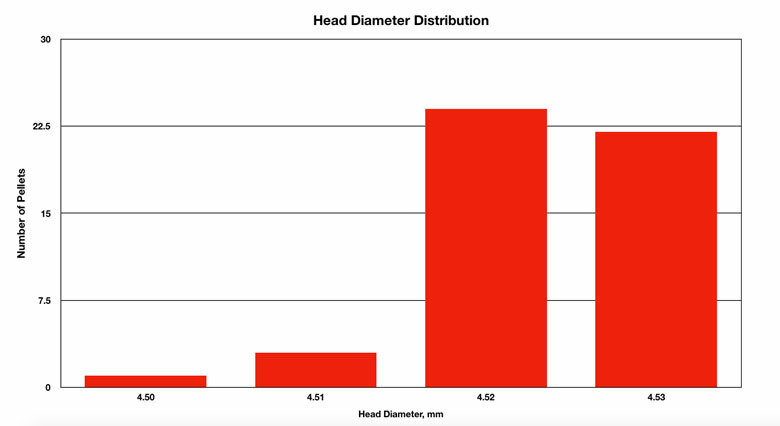 Consistency of head diameter among the Rifle Premium Flathead 8.18 grain .177 caliber pellets tested by HAM was below average. 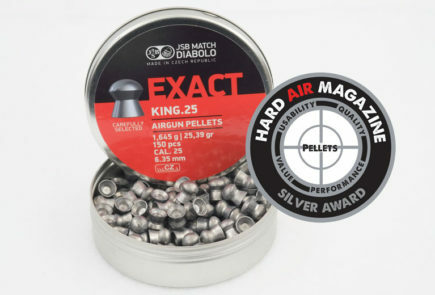 Just 48% (24 pellets) had the most common head diameter of 4.52 mm. 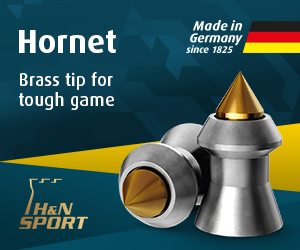 The variation between the smallest and largest head diameters – from 4.50 to 4.53 mm – was 0.7%. This is about average manufacturing consistency. 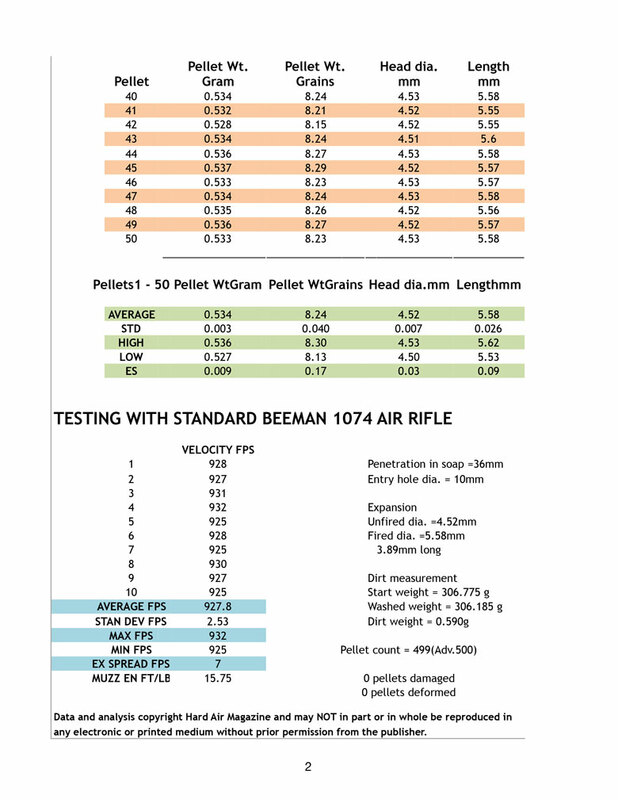 Weight consistency, however, was well controlled among the Rifle Premium Flathead 8.18 grain .177 caliber pellets tested by HAM. There were 20% at both 8.26 and 8.27 Grains. A figure of 20% at the same weight is good performance in manufacturing consistency. 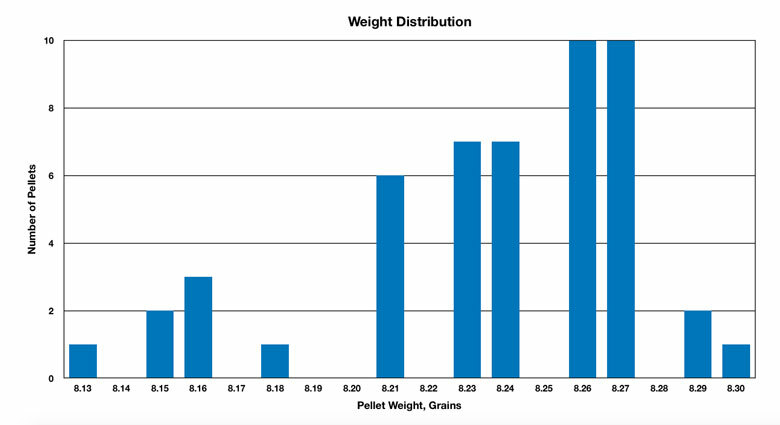 The variation in weight of the tested pellets – between 8.13 Grains and 8.30 Grains – was 2.09%. Again, this is a better than average consistency score, although the average weight is rather higher than the claimed weight. As always, all pellets were weighed using HAM’s ultra-precise milligram balance for precise, accurate and consistent measurements. 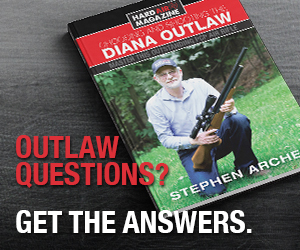 18% of the pellets tested by HAM had the same lengths (5.58 mm and 5.60 mm). This is slightly less than average. 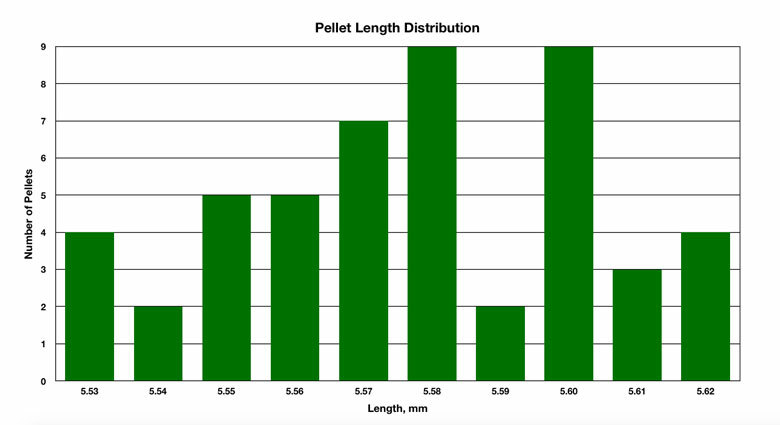 However, the variation between the shortest and longest pellets was just 1.63% (from 5.53 to 5.62 mm) and this is rather better than average. 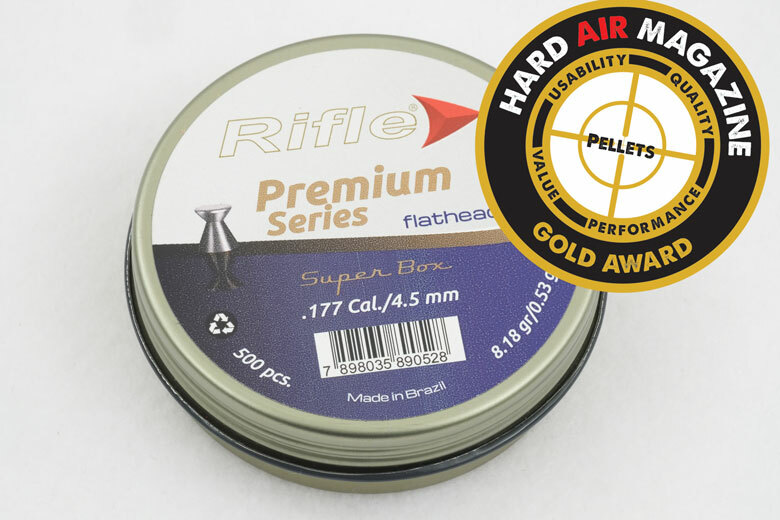 It has to be said that these Rifle Premium Flathead 8.18 grain .177 caliber pellets are the dirtiest ever tested by HAM! 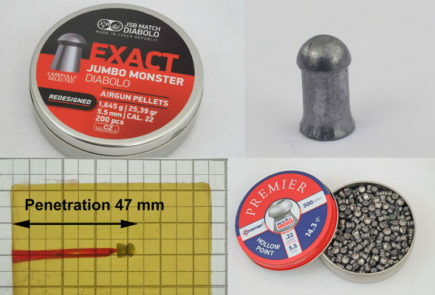 No less than 9.10 Grains of lead dust and dirt were included in this tin of pellets. That, in itself, could be another reason for the very slight pellet under-count, as it’s more than the weight of one pellet. As there were a nominal 500 pellets in the tin, that makes 1.82 Grains of dirt per 100 pellets. 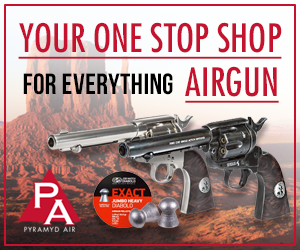 Of course, you should always wash your hands thoroughly after handling lead airgun pellets. But that’s even more important than ever with these Rifle pellets. 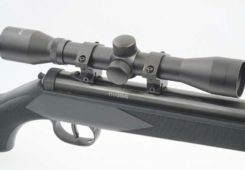 Rifle Premium Flathead 8.18 grain .177 caliber pellets are intended for 10 Meter shooting, so downrange performance is not really intended to be their forte. 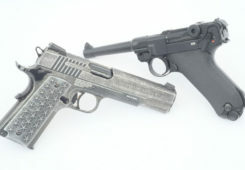 With a typical BC for wadcutter pellets, essentially “flat” shooting can be obtained from HAM’s standard “1,000 FPS” test gun between 11 and 40 Yards. The Chairgun graph below shows how this plays out. 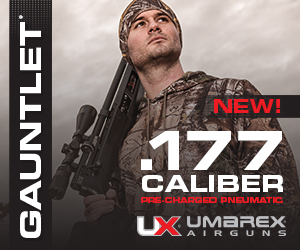 Again, the Rifle Premium Flathead 8.18 grain .177 caliber pellets are not intended for hunting. 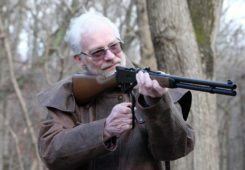 They loose Kinetic Energy very rapidly downrange, as do all wadcutter pellets, with 50% of the initial Muzzle Energy already lost at 30 Yards. 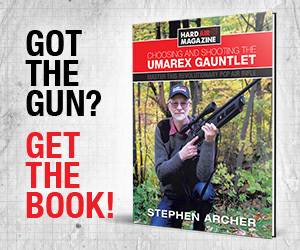 However, it’s clear that Rifle Premium Flathead 8.18 grain .177 caliber pellets would be a devastating choice for hunting small critters at very close range. Once retrieved from the soap block, it was apparent that the pellet had expanded hugely from 4.52 to 5.58 mm diameter. 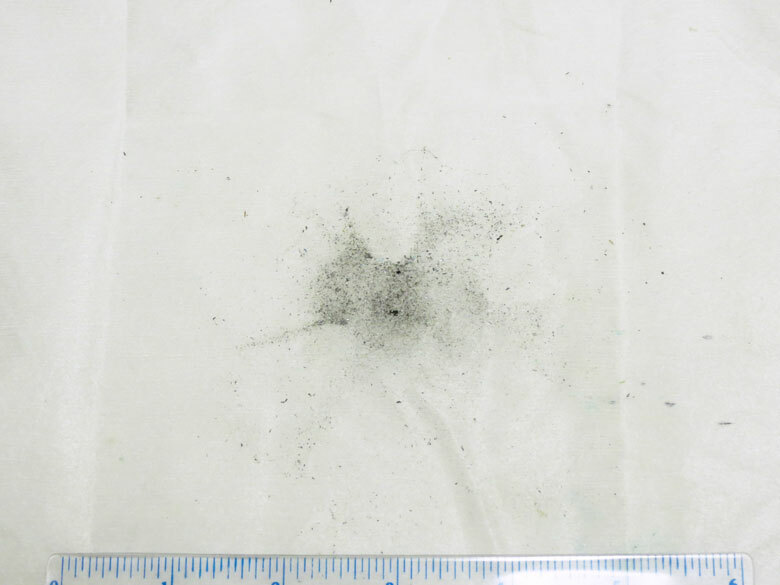 The wound channel was 10 mm in diameter and the pellet traveled only 36 mm into the ballistic soap block. All of this indicates massive and immediate transfer of energy. 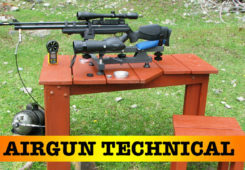 This would cause a humane one shot kill if used on small pests at close range. 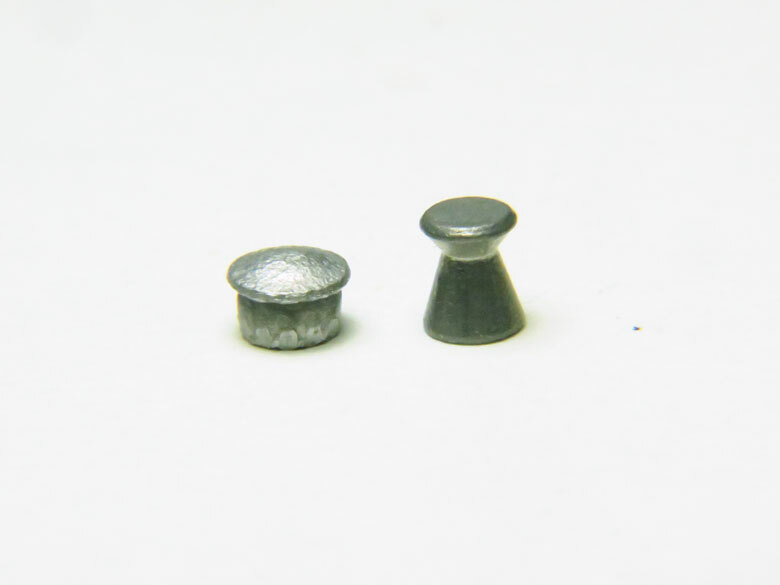 These pellets are supplied in a good-quality screw top tin. The top was easy to open and the general design and finish of the packaging gives a feeling of quality to the product. The inside of both tin and lid are coated, for example, rather than being bare metal. There was also a round sheet of foam to prevent the pellets from moving during shipping.